Sedona is Arizona’s premier destination for stunning scenery, art and culture. Simply put, Sedona, Arizona is a natural wonder. 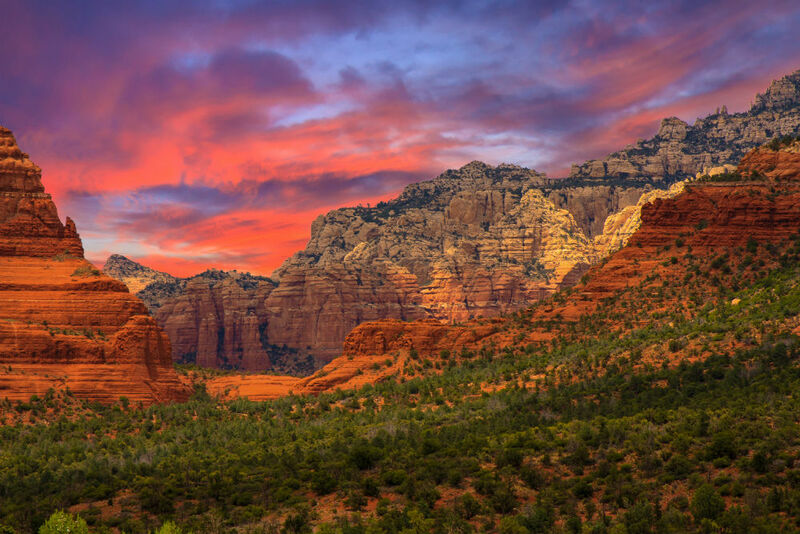 From its majestic red sandstone buttes that rise to meet a brilliant blue, cloud-tinged sky that stretches seemingly forever, to its dense pine forests, to its jaw-dropping, precipitous canyons—all of which are heaven for hikers and rock climbers—Sedona is considered by many to be a spiritual, even sacred place. Then there’s the town itself—a quaint campus of pueblo-style buildings housing more than 40 art galleries, New Age shops, spas, wellness retreats and dining; plus, nearby wineries and vineyards. With an elevation of roughly 4,300 feet and a mild, high desert climate, Sedona lends itself to activities centered on the arts and the outdoors all year-round. Here are a few of my favorite reasons to visit. A must-visit for art and jewelry lovers, the Sedona Arts Center in town is a one-stop shop for one-of-a-kind finds. The fine art gallery and store showcases works by local artists—from paintings to sculptures to jewelry, fiber arts and photography—and hosts art classes, workshops, field exhibitions and exhibits year-round. The Sedona Plein Air Festival is its signature annual event, slated this year for Oct. 13-20. Watch more than two dozen master painters in action; along with a juried art competition, lectures, workshops and free community events. For nature seekers, Red Rock State Park is the epitome of the great outdoors. Living up to its name, the 286- acre nature preserve is home to hiking, biking and equestrian trails that deliver arresting views of red sandstone canyons and rock formations at every turn. Nearby, the iconic Cathedral Rock offers its own steep hikes to the top if you dare. Just south of Sedona, Bell Rock, with its jagged, bell-shaped layers and burnt red hues, is a popular destination and photo op—with a relatively easier hike to reach it. A hotbed for arts & culture, Sedona hosts fabulous festivals throughout the year. Summertime in Sedona closes with the 10th annual Sedona Winefest, Sept. 22-23—featuring wines from across Arizona, local restaurants and live music at the historical Posse Grounds Park in the heart of town. At the Sedona Arts Festival, Oct. 13-14, take in works by nearly 130 artists on the Sedona Red Rock High School campus; along with a kid zone and a gourmet food gallery. And plan now for next year’s Sedona International Film Festival, Feb. 23-March 3, 2019— celebrating the best independent films from across the globe with 160-plus movies being screened, filmmaker and celebrity appearances and parties. Also keep these events on your radar for next year. Chamber Music Sedona presents the Sedona Spring Music Festival in April, with a series of outdoor concerts by renowned classical musicians. The Illuminate Film Festival (late May/early June) is a premier film festival dedicated to “conscious cinema.” This means transformational content devoted to such subjects as sustainable living, wellness, consciousness, spiritual practices and mind-body science. View dozens of shorts, full-length films and documentaries; plus, lectures and special events. There’s even a “healing lounge”—stocked with massage therapists, reiki specialists, Chinese tea experts, sounds healers and more—to relax in between movies. Lodging in Sedona includes boutique hotels and five-star resorts. L’Auberge de Sedona is a favorite, nestled in the heart of red rock country on the banks of Oak Creek. Get pampered at the nature-inspired L’Apothecary Spa; enjoy alfresco fine dining at Cress on Oak Creek; and rest your head on luxe linens inside a posh cottage with every amenity imaginable (many have outdoor showers and fireplaces). In the morning, feed the ducks along the creek, take a complimentary yoga class and go exploring amid the striking Sedona scenery just steps away. Another magical escape, Enchantment Resort just outside Sedona sits in (yes, in) Boynton Canyon, on 70 pristine acres surrounded by rugged red rock. Embracing the area’s Native American history and culture, the adobe-style resort offers film screenings about the Apache, Navajo, Hopi and Yavapai people; plus, solstice celebrations and the educational Camp Coyote program for kids. Enchantment also offers mountain biking, tennis, guided tours and hikes, golf, the Mii Amo Spa (rated the no. 2 spa in the world by Travel + Leisure ), four world-class restaurants and a wine bar. Accommodations include lavish casitas with private decks perfect for catching the sunset and stargazing over the canyon. You may never want to leave.